A film that celebrates everyday heroism, Sully makes the commonplace special and brings that little element of hope and magic into your cynical, weary, work-infested life. How nice it is to be told that this is a true story, and how fabulous that Clint Eastwood is eloquently retelling this tale worldwide. The film debates the never-ending man v/s the machine question, among other things; what's a man to do when the monster-machine he's supposed to be in charge of spins out of control, endangering hundreds of lives? 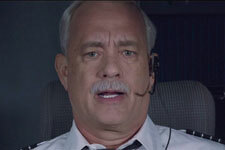 In the case of Sully (Tom Hanks), it's to act with spontaneity and, more importantly, humanity. The human question is topmost on the minds of the pilots who have just hit a flock of geese, are flying a plane with two busted engines, have never been trained for such a situation before, have only 250 seconds to make a decision, and are unable to make a safe landing on any nearby runway. Sully, who had taken sole control of the plane when disaster struck, decides to make a risky water landing on the River Hudson. In what's later called a "miraculous" feat, he culls from all his years of experience as a pilot and safety expert to succesfully save every one of the 155 lives aboard that ill-fated plane. On his return, Sully's an instant hero. The media adoration seems to last forever, but the airlines company is upset about the damaged plane, because they still believe, and have conclusive computer-simulated evidence, that Sully could have made it to the nearest runway without pulling a stunt like a water landing and endangering so many lives. Man vs The Machine again, and Sully bares his inconsistencies to the jury - he lets them know that he and his co-pilot weren't trained for the hazard. Unlike the pilots in the simulation, there was no one to guide them in their decision making. And they had only 250 seconds and one single attempt to save hundreds of lives. Because there are no robots on that jury, and it's still only 2009, Sully gets his due after a crucial scene which forms the climax of the film. The focus of the film is more on how relentlessly Sully was pursued by a capitalist entity keen on achieving its financial goals after the crash, than on the emotional distress onboard the plane as it went down. The company is keen to paint him as the reason for the crash rather than a saviour. At some point, when the "human question" that Sully emphasises so much grows to such terrible dimensions that the company discovers that reputation management could cost them more than the plane, they back off. However, this fact lurks in the recesses of the narrative and isn't dealt with forthrightly in Sully. Anyway, here's a moral: This is what good karma is about, and Sully's good karma bailed him out. Sully deviates a bit here and there. The audience is introduced to the passengers of the plane, and some sort of quick narrative is sketched around a few of them, but it all goes for a toss eventually because the film itself is about what happens after the crash. It about Sully's stoic, personal, isolated struggle as opposed to a chaotic, mob-run narrative involving the passengers. This emotional rift that Eastwood seems to create between the hero and the teeming masses, even though they're all in the same boat together, is seen when Sully appears on the David Letterman show with some passengers he saved. All three 'chosen ones' are women, all seem like mere talking heads, and none says anything worthwhile. The amazing ability to make a crucial life-saving decision in 250 seconds, and actually execute it successfully, hasn't been dwelt upon enough in Sully. A technician in the control room remarks that Sully "sounded so calm" when the plane was going down, and later when Sully and his co-pilot Jeff Skiles are being grilled by the jury, Sully takes some time out to give his teammate a morale boost, but that's about it. 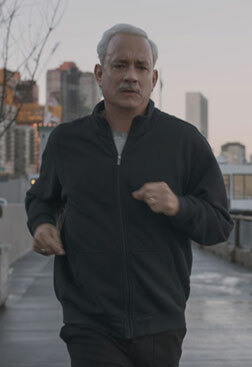 The film also shows Sully taking a personal initiative in evacuating passengers, handing out blankets himself, and being the last to leave the crash. However, overall, you can count such incidents from the film on your fingers, because the movie, despite being about the "human element", fails to give much importance to human merit and achievement. The film doesn't show Sully getting an award eventually. It shows him being let off the hook, as if that is reward enough, and it tries to make this fact look good. Sully is a movie that says hope is beautiful but ought to be persecuted; nobility is meaningless without a little smear to sully it. Clint Eastwood makes a good film, and Tom Stern's cinematography brings out the best in the script. The film is well-edited and stays interesting all through. Tom Hanks is absolutely brilliant - he IS Sully, and very convincingly so. Aaron Eckhart is convincing, and Laura Linney as Sully's wife makes her presence felt finely in a small yet significant role. Sully is a good film to watch over the weekend - definitely recommended. fullhyd.com has 700,000+ monthly visits. Tell Hyderabad what you feel about Sully!